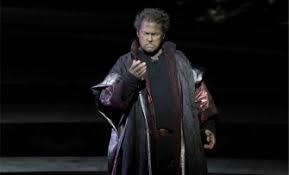 When Aleksandrs Antonenko pulled out last night at the Met after the first act of Samson et Dalila, his replacement for the last two acts was the veteran Gregory Kunde, last seen on the Met stage in 2007. Where has he been all this time?, audience members wanted to know. Could this be the start of a glorious comeback? No glorious comeback. Just another leathery tenor in the circuit long past his sell by date. But because singing standards have been lowered to bottom of the barrel levels this stunt now passes for glory. Very sad state of affairs. And Antonenko keeps causing trouble, we see. Why is he still getting hired? He was probably contracted five years ago, when his voice was in better shape. And what have you accomplished with your life, aside from posting anonymous snide comments on the Internet? I’m curious, Caravaggio, were you there last night? Because I was. Maybe Kunde didn’t sound as fresh as a tenor half his age, but he gave a nuanced, controlled, lyrical performance that was a masterclass in solid vocal technique and career longevity – topped by a brilliant final high Bb that rang to the rafters. And he jumped in at the last minute and did all of that under stressful circumstances. This compared to the disaster that was Antonenko literally shouting his way through Act I? (I’m still trying to forget his befouling of the Verdi Requiem last year, ugh.) I’ll take the spit and leather, please. You’re wasting your time – Caravaggio is just embittered because his own career in opera has amounted to 0. To answer the question: he’s been singing all over, but at the MET. Heard him at ROH. The Met is NOT the centre of the opera world at all ! Not singing there is no loss for every singer. There are great singers and big stars who never sang there or havent sung there for long time. Problem is who is making this decisions at the MET. Maybe the same one who said was leaving after Levine but still there! Congrats to Kunde! Ebbe Stignani, Dietrich Fisher-Dieskau, Claire Watson (I believe), Nazzareno De Angelis(A crime, I think he was the best Mefistofele (Boito) of his generation. I think even for artists who appeared here, the Met is not really an artistically nurturing house. So, some artists king of put it in their resumes and then have a very limited relationship with the house (like Kauffman) or no relationship at all like Harteros or, better yet, Bartoli, who in true diva fashion took control of her career and made of it what she wanted. Harteros actually appeared at the Met. With limited success. Mary Garden, obviously. The great Sena Jurinac, though Bing repeatedly tried to get her. Bartoli’s is a special case, her voice was simply too small for the Met. She was known as “La Muta” when she was there. But you’re right, singers like Gobbi and Hotter and Varnay (in the Bing years) did not find it to be an artistically nurturing house. Listen Richard Craig NOT all the greatest singers in the world have sung at the Met. Boris Christoff, for another example. But this is true for every opera house. For example Maria Callas and Ezio Pinza never sang at the Vienna State Opera. This doesn’t make the House on the Ring less great, even though for Callas and Pinza not singing there was no loss for them. It was however a big loss for the Viennese public. Kunde would definitely be an improvement over Antonenko. I have tickets for a later performance and am so hoping Antonenko cancels. He was just dreadful in last fall’s Aida at the Met. Why do they keep hiring him? Right-Kunde is not the issue, Antonenko is. He was never very good, and in the Aida he was unbearable-why was he even back for Samson? If you don’t have singers at a certain level, you can’t schedule the operas. They put-what was his name-de Leon- in for the last Aidas-yes a little better but still not acceptable. There are only light tenors of quality out there, and some medium voiced ones on their way to ruin-it seems the only solution is not to perform the operas until you have an adequate cast of principals. Why did the Met hire Jorge de Leon to sing Radames? He would have been a disgrace in even the most provincial house. Gelb seems to have a fondness for vocally dysfunctional tenors. I am with Caravaggio on this subject. Kunde had a lovely lyric voice years ago. He was never a dramatic or heroic tenor. Age and singing heavier roles affected the instrument, naturally. Good of him to step in on a short notice. Antonenko’s voice is in serious trouble. He should probably do what Ben Heppner did a number of years ago-stop singing and get treated before it is too late. It took Heppner several failed performances (3 recitals where I was present, when he was forced to stop because his voice failed him.) It was painful to watch and I can only imagine what a singer goes through when this happens. How right you are! It’s always uplifiting to read Signor Carravaggio’s comments. He never fails to brighten my day.